Becoming organized is the first step towards becoming a more productive and efficient worker, but chances are, you aren’t nearly as organized as you know you should be. From the papers on your desk to the files on your computer, being organized is a very important skill to learn. If you maintain an organized environment, not only will you be better able to locate important information within a tight time frame, but you’ll also feel more motivated. Because cleanliness and organization are mood boosters at their core, they help to encourage calm, promote concentration, and foster motivation; motivation, in turn, is a direct precursor of productivity. Although the term “multitasking” is used very frequently in today’s busy society, the truth of the matter is, very few people are even remotely skilled multitaskers. With very rare exception, human beings are capable of competently performing only one mindful task at a time, so multitasking should generally be avoided. Unless one of the tasks you’re attempting to perform is completely mindless, by trying two tasks at once, you will inevitably be neglecting both. Therefore, in order to promote efficiency and productivity in the workplace, you should minimize distractions around you to help sharpen your focus. Whenever possible, cellphones should be switched to vibrate, email notifications should be turned off, and email checks should be scheduled to occur within specific time frames. If the thought of cutting yourself off from technology throws you into a panic, take heart, and remember that there was a time not too long ago when society functioned perfectly well without email and cellphones. 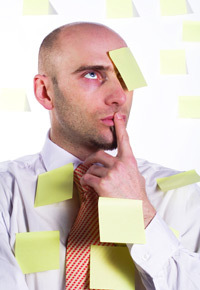 Prioritizing is essential to becoming a more efficient employee. If you are not adept at prioritizing, then some of your most important assignments could go unfinished, or your workload could start to become overwhelming. A great way to prioritize is to make to-do lists. Break tasks down into specific instructions, and then rank them according to their importance (based on size, time-sensitivity, personal gratification, etc.). When tackling your to-do lists, be sure you aren’t simply performing the easiest tasks first in an effort to make yourself feel productive. After you’ve ranked the tasks according to importance, it’s crucial that you actually complete them in that order. 4. Assign tasks to specific times. First, determine what time of day you are usually more motivated and productive, and schedule your most important tasks to be completed during that time block. 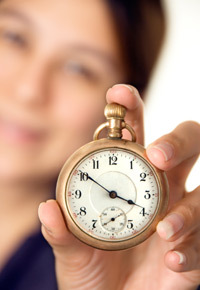 By assigning tasks to specific times, you help to keep your procrastination under control. Anticipate minimal distractions, and build those into your daily schedule. In order to keep yourself on track, give yourself small rewards in exchange for reaching certain milestones. For example, if you stick to your plan for a specified amount of time, reward yourself by taking a 10 minute break to engage in some cyberslacking or social networking. Just make sure you’ll be able to get back to work promptly after your break. 5. Resolve issues at home. Home lives and work lives are not nearly as separate as they once were, thanks in part to technology, and if your home life is hectic and stressful, then your productivity at work will surely suffer. 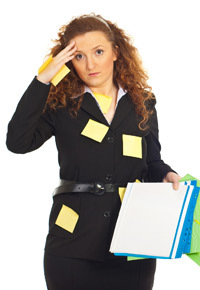 Spousal problems, financial woes, and just a general feeling of stress are all guilty of affecting employees’ performance at work, but by correcting these issues, these employees would certainly become not only more productive, but also much happier. There are a number of ways to combat stress at home, including exercising, practicing meditation, maintaining a healthy diet, and exploring therapy, among others. In order for employees to be at their best when they’re on the clock, they need to make sure they’re getting plenty of sleep, spending enough time with their families, and making every effort to ensure that their home life is healthy and balanced. Although your productivity at work may not be reaching its full potential, there are a number of ways you can improve your performance. By getting organized, prioritizing, and delegating tasks, you can help to get your important assignments completed well and on time. Minimizing distractions at work is extremely important, as human beings are inherently unskilled at multitasking. Finally, because it’s very difficult to leave one’s home life completely at home and because issues at home often result in decreased productivity at work, you should do everything in your power to reduce stress and unhappiness at home. You and your company will both be much happier as a result. I would recommend checking out Gtdagenda for an online productivity tool. Thanks, Dan. Gtdagenda looks good! Great starter productivity article Andrew! The resolving issues at home, I didn’t even really think about… but it totally makes sense. A healthy and productive home life results in a healthy and productive work life. You have to find that perfect work-life balance. Getting organized may seem easy, but it can be the most productive things to do each day. Knowing what needs to get done and prepare everything before the day starts. Your typing speed is crucial here. The faster you type, the faster the response will be. Even if you don’t have an immediate answer, you can at least acknowledge the customer question with a quick reply to let them know that you’re working on it. A day consists of 24 hours. But we hardly work for 9-10 hours a day. So, if our working hours does not be productive, then we can’t attain the success we want in our professional life. It is not a rocket science to be productive at work. You need to track your performance, set your own deadlines, say ‘No’ to multitasking, maintain a good diet, avoid getting distracted and be proactive instead of being reactive so that you can improve your productivity at work. I would like to thank Andrew for sharing such an informative post. Thanks for the tips. What helps me to stay more productive at work is using a productivity tool. In my case it’s Kanban Tool ( https://kanbantool.com/ ). I like it a lot and it works really well, plus it’s not very complicated, so everyone can use it. It can serve as a time tracker, a task management tool and a team management tool, so it’s multifunctional as well.